I grew my first zucchini plant in our backyard this summer (love growing my own food!) 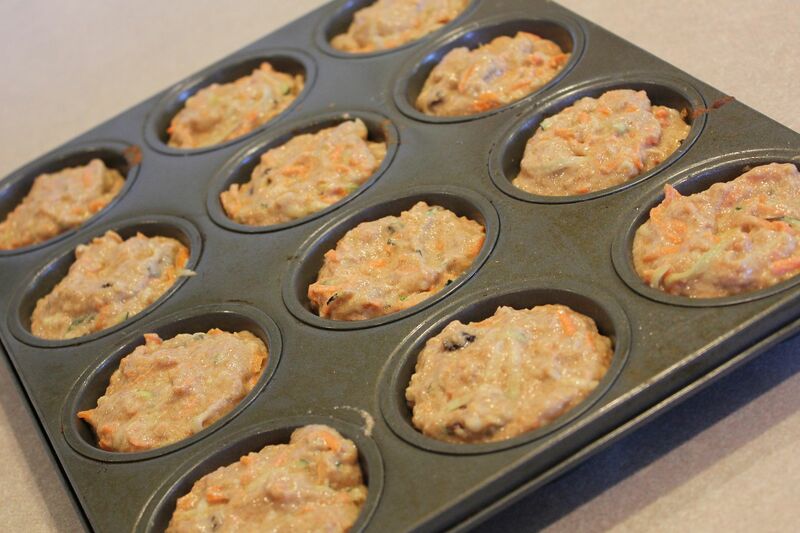 and these muffins are my favorite way to use them up. The applesauce and orange juice in this recipe gives it an added sweetness and flavor that prevents Kate from turning her nose up at the fact that it’s veggie-packed, and keeps it from needing too much sugar. Winning! 1. Beat egg in a large bowl. 2. Add orange juice, applesauce, and sugar. Beat well. 4. 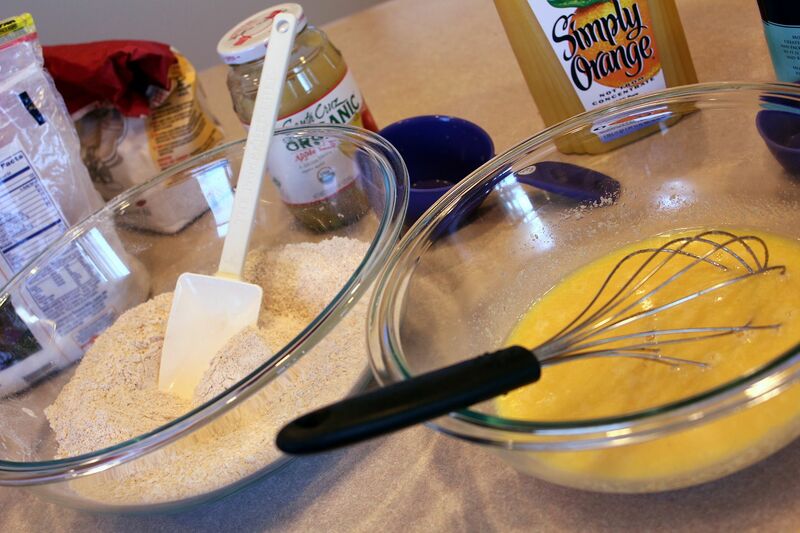 Stir dry ingredients into egg mixture. Mix until moist. 5. 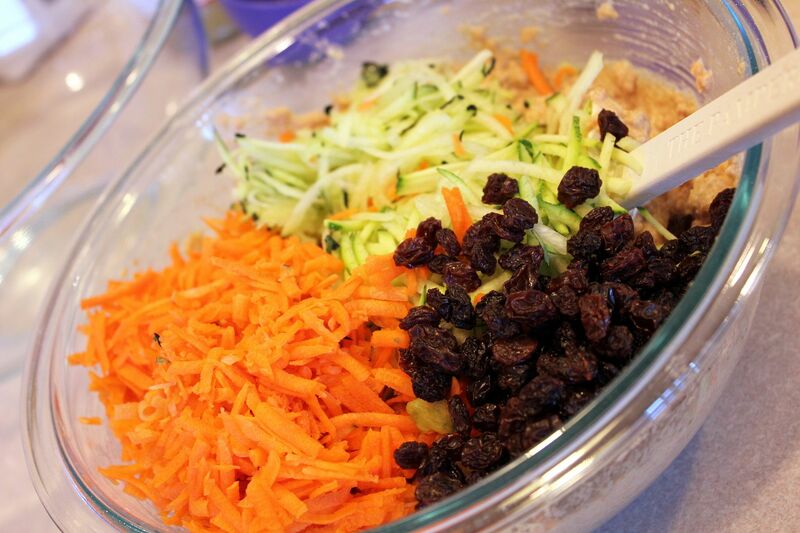 Gently fold in shredded carrots, shredded zucchini, and raisins. 6. Spoon into well greased muffin pan, about 2/3 full. 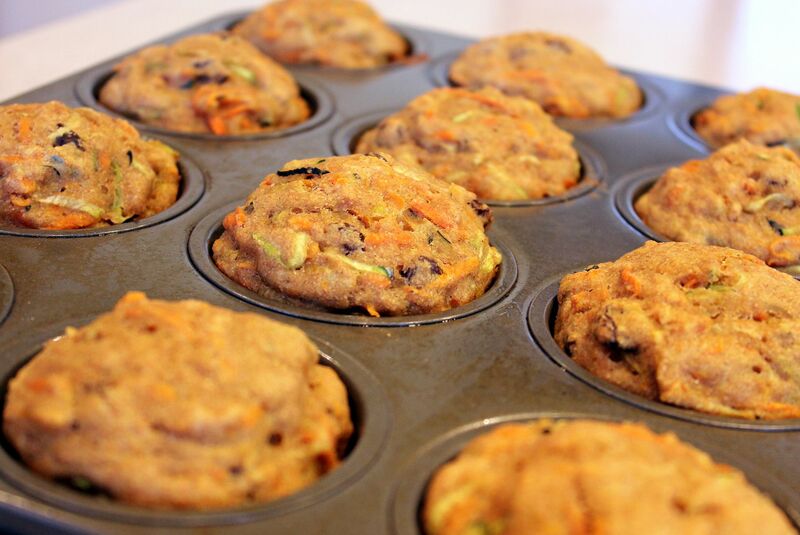 This recipe makes 12 freezer-friendly muffins. Enjoy! Yum. Love the way the veggies are snuck in there! Those look really good, if I could convince my husband to try them I would so make them, where did you get the recipe? Those sound good. Healthy. I wonder if they would stay healthy if you added chocolate chips? Mm. Oh man I could tear these suckers UP right now. Nomnomnom. @J. Obrien–I linked the recipe credit at the bottom of the post. I found this on Food.com. @jbhat–I like where your head’s at. Make it happen. @Beth–I’d Fed Ex some to ‘Bama! I made these today for my husband’s mid-morning snacks while at work. Of course I had to sample one. Delicious. Nice and moist and yummmy. Next time I may put a little more cinnamon in for our tastes but otherwise they are fabulous! So wonderful to hear! Thank you Anonymous! Like all the recipes you post- this is a winner. I think these are now my new favorites, just beating out the protein pancakes. You should think about creating a G&D cookbook…seriously;) Thanks for sharing such easy, healthy and delicious food. You are too sweet Alison, thank you! @CC: I used the shredder attachment on my food processor. I hope you liked your first batch! Can you suggest a good substitute for zucchini? My 2 year old daughter hates zucchini.. I love you dusty , And I love Kate more.. Following you through the past years I feel like a part of your little happy family. @CC: So happy to hear they were a hit! @Emily: Such a sweet comment, thank you. 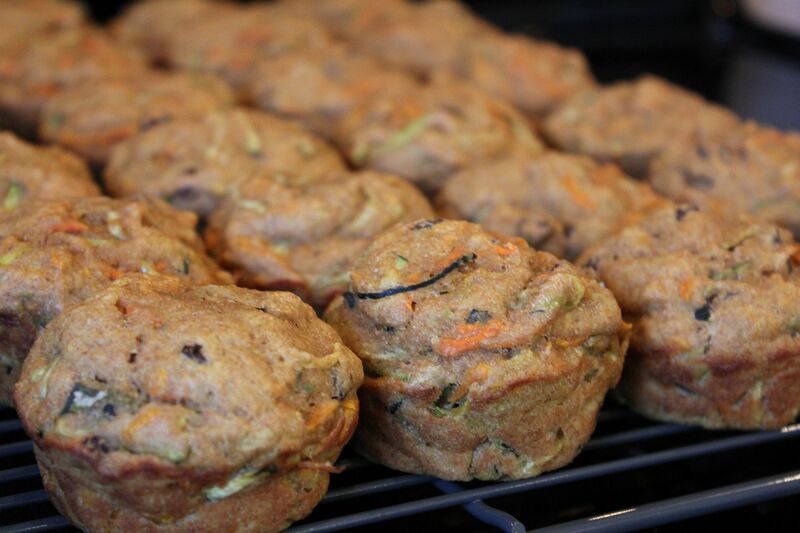 I would suggest simply omitting the zucchini – or if you’d like, you could increase the carrot a little bit. Hope that helps! we love these! I’ve made them five times! last time we added chopped apricots and a little ginger powder. I bet they’d be good with walnuts too! I’m so happy to hear you’re enjoying the recipe Kat. Those additions sound wonderful – thank you for sharing! Oh goodness … these sound amazing!! Have you ever tried them with an alternative flour? I’m thinking almond and brown rice? ?